A Sunshine Coast furniture removalist has become the first operator in Australia to take delivery of a Chinese-made JAC light duty truck with Woombye based Furniture Removals and Transport covering more than 3000 kilometres in the first week of ownership. 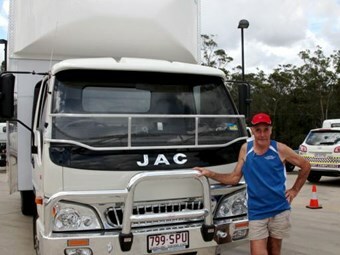 Bill Watt a 30 year veteran of the furniture removals industry purchased Australia's first JAC from Sunshine Coast based dealer Ray Grace Truck Sales at Forest Glen and says that the truck's Cummins engine was a major factor in deciding to give JAC a try. "I have traditionally run Japanese built trucks but a recent glitch with one of those trucks left us high and dry and well and truly out of pocket so we decided to give JAC a go," said Bill Watt. "Price was obviously a consideration but the main factor was the Cummins engine and the strong warranty," Bill said. "Obviously the price was very attractive given that the JAC was $20,000 less than the quote I received for an equivalent truck from the Japanese brand we have been using up until now, but the peace of mind that comes from a Cummins engine and strong warranty was far more important in my eyes," said Bill. Immediately after taking delivery of the new JAC J65 from Ray Grace Trucks sales manager Gunther Kettniss, the Furniture Removals and Transport JAC was pressed into service for a 3000km round trip to Clairmont and Blackall in Central Queensland. "The JAC did not miss a beat and in fact it performed as well if not better when fully laden with furniture than it was unladen on the way up," Bill added. "It really performed well, sitting on 100km/h all day and sat on the road beautifully," he said. "It even went over the top of the Gateway Bridge in Brisbane in top gear at 80km/h with a full load on board, that was very impressive and I am sure it will get even better as we put more kilometres on it," said Bill. "We've already nick named it JAC the Giant Killer!" Bill added. The Furniture Removals and Transport Sunshine Coast JAC will not normally be used for long runs such as its maiden voyage, with bill and his team assigning the light duty J65 to local delivery work around the Sunshine Coast and its hinterland. "Generally we will confine it to the local runs up to Hervey Bay in the North and down to the Gold Coast in the south, but its good to know she will handle a longer run with ease if we need to." The company operates a fleet of four trucks including three Japanese medium duty units along with the new JAC J65. The 6.5 tonne JAC J65 is powered by a 3.8 litre Cummins ISF engine and a six speed JAC transmission with a 6.5 tonne GVM. The J65 delivers maximum power of 141hp at 2600rpm and 450Nm of torque at 1300rpm giving performance comparable and at times exceeding that of its Japanese rivals. The Cummins ISF 3.8 litre delivers tremendous fuel economy along with a low, flat torque curve making the JAC light-duty models extremely flexible and easy to drive, particularly in city traffic. Cummins' efficiency allows it to employ a smaller cubic capacity and excellent torque across the rev range meaning greatly reduced fuel consumption. All JAC light-duty models are equipped with Selective Catalytic Reduction (SCR) emission control as opposed to EGR which is used by most opposition light-duty brands. SCR is more efficient and cleaner enabling the Cummins engines to run cooler and more efficiently than EGR equipped trucks. As well as running cooler and delivering better fuel economy, there are less restrictions as well as wear and tear on the engine with SCR compared to EGR. SCR also negates the time consuming and frustrating need to stop the truck and clean the particulate filter when it reaches a certain contamination level. The JAC J65 and J75 models are the only light-duty trucks on the Australian market to boast full air brakes enhancing safety, durability and performance. Meanwhile the J65 is close to class-leading in terms of front axle capacity and equal top in class for rear axle capacity, while offering close to the best dimensions in its class for body length. Standard features on all JAC light-duty models include ABS anti-lock braking, EBD, power windows, air-conditioning AM-FM-CD-MP3 audio system, remote central locking, door pockets, cup holders and entry assist handles.